Wire2Air outlook text message service allows you to send SMS text messages to your colleagues and customers from Microsoft Outlook 2007, Outlook 2010, Sharepoint 2010 and email address. 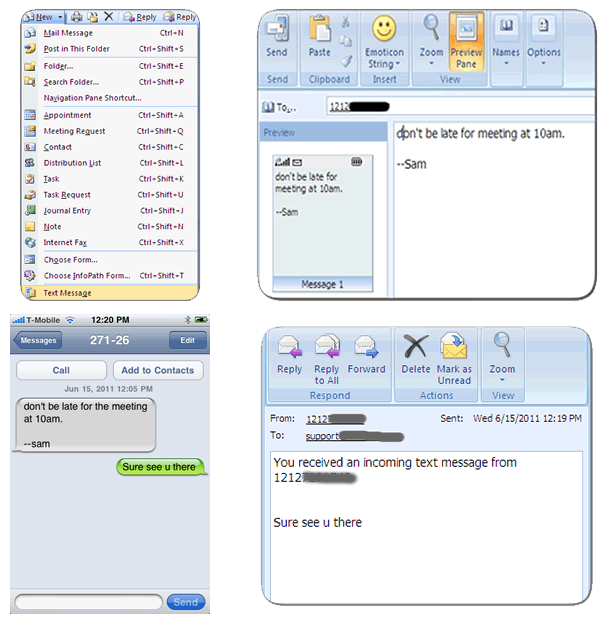 Wire2Air email to text message service allows business to send text message to USA, Canada and 800 Global networks. It easier and convenient to create and send text messages to mobile devices directly from outlook email client. Select recipients from outlook mobile address book, counting the number of characters in a message, previewing the message and managing all your messages. Any replies to your text message will be automatically forwarded to your email inbox. Allow multiple users to use the system – a powerful tool for office communication. Administrators can assign each user specified SMS credits. This feature allows you to extend SMS to your desktop. By using your email client to send SMS’s you can easily communicate with one person or groups of people while using a familiar interface. Wire2Air provides businesses and individuals SMS messaging gateway connectivity with carriers in the USA and around 800 mobile networks in the world. Microsoft Outlook 2007 & 2010 have a built-in feature which allows users to send SMS Text messages from Outlook through SMS gateway service provider certified to work with Microsoft outlook messaging services. Wire2Air is acting as SMS gateway & business text message service provider for sending and receiving text messages from wireless carriers such as T-Mobile, AT&T, Verizon, Sprint, Virgin, Cricket, etc. But you don’t need to know recipient carrier name to send text message our server will do carrier lookup. Select plan and signup for the outlook text message and email to text message service. Configure your outlook, add outlook mobile service provider (Text messaging) same as you would add email provider. Now, you’re ready to send and receive text messages directly from your mobile. The reply from recipient(s) will be forwarded to your outlook. 1. Can I send text message to multiple receipients? Yes, you can send text messages to multiple receipients. 2. Is it possible to send messages longer than 160 characters? 3. Does message recipient needs to include any keyword in their reply message? No, reply doesn’t need to have any keyword in their message. 4. Can we allow anyone from our company to send a message, can we create multiple user accounts? 5. Do I need to know wireless carrier or operator of recipients? We have plan starting from $49.00 a month which allows you to send and receive upto 1000 messages. Remaining text messages will rollover to next month. For all plans information, click here PRICING. 7. What is the outlook text message service web address?